I’d value your prayers, as this has left me…er….penniless! – until a friend gave me £40 this afternoon. I’ve been here before, over the years, many times (not all bank fraud, just the five!). Fortunately, I have petrol in the car – I’m speaking in Portadown this evening at a Full Gospel Businessmen’s meeting so I can get there and back as it’s 100-mile round trip, but then it’s….. ???? for a week or so….. Portadown is a Christmas Dinner, so I’m fed for today, so God has had that in hand! 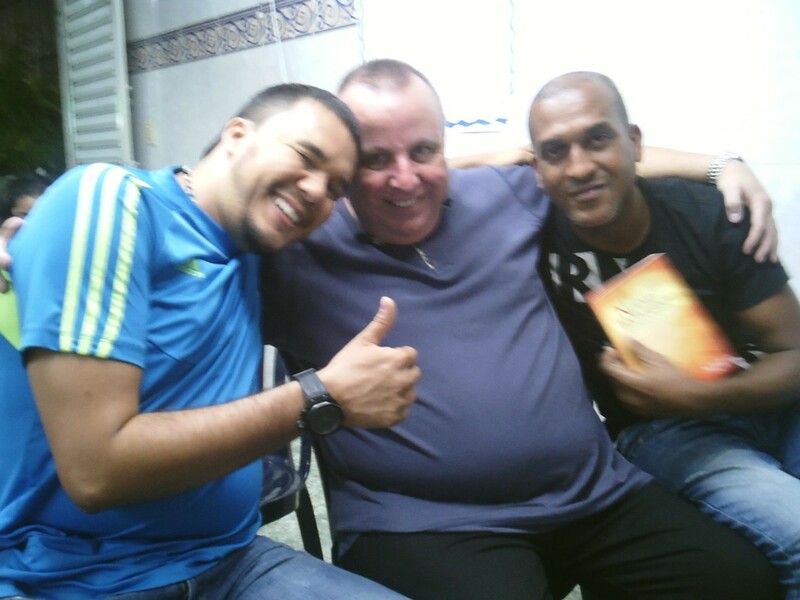 Five years ago today, I had the joy of meeting these two guys – the one on the left, Dario, has become a great friend since this night in 2012, when God began a miraculous transformation in him – healing him as we hugged then from multiple gunshot wounds. He then ran a number of favelas (I won’t unpack that here – look it up on google or wikipedia if you don’t know what it is!!). 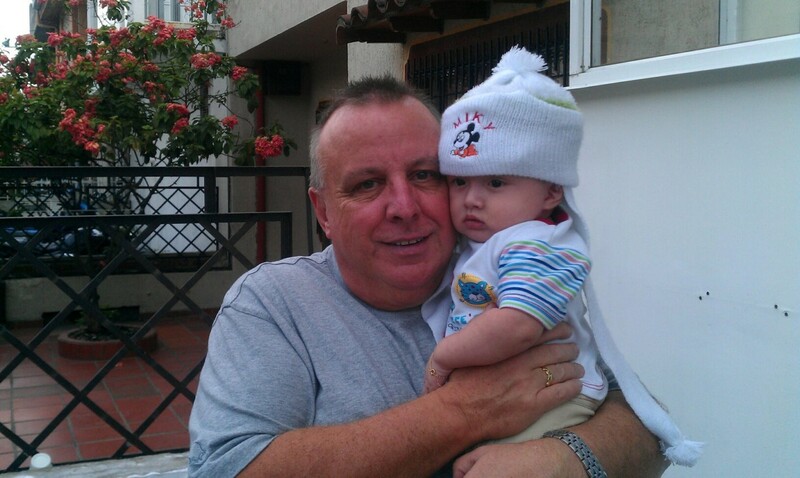 A more ‘unlikely’ friendship would be hard to find in so many ways, but there’s a real bond with him…. 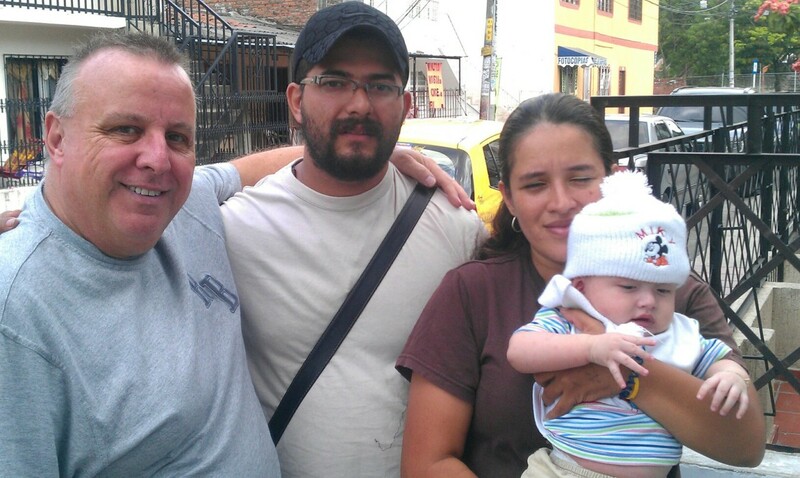 Jose Luis, Aida, and Jose Luis Jr., – one of the most special astonishing miracles I’ve EVER had the privilege of being involved in… 6 years ago today, in Cali, Colombia (Kids hospital Club Noel) when Junior was just a few months old, had the opportunity to pray something I’d never ever prayed for: he was born with NO fontanelles and NO sutures in his skull, which meant of course, that his cranium was solid, with no room or flexibility for his brain to grow. His future was more than bleak, to say the least – brain damaged, severely handicapped physically, more than likely dead very young. Dad had brought his skull x-rays to another brain surgeon – my long-time friend Doctora Dunia Patricia Quiroga, who told him to get the x-rays ‘prayed over by the Englishman in the waiting area’ of the kid’s hospital, and then to bring Junior to the hospital to be scanned by her…three hours later (maximum, I reckon), Dunia called me. Jose Luis Jr had all the necessary fontanelles and sutures in his skull for a perfectly normal life…. God is SO incredibly amazing, powerful, creative, merciful, kind….you name the adjective! Oh yes, and Mum and dad both gave their lives to Jesus ….. 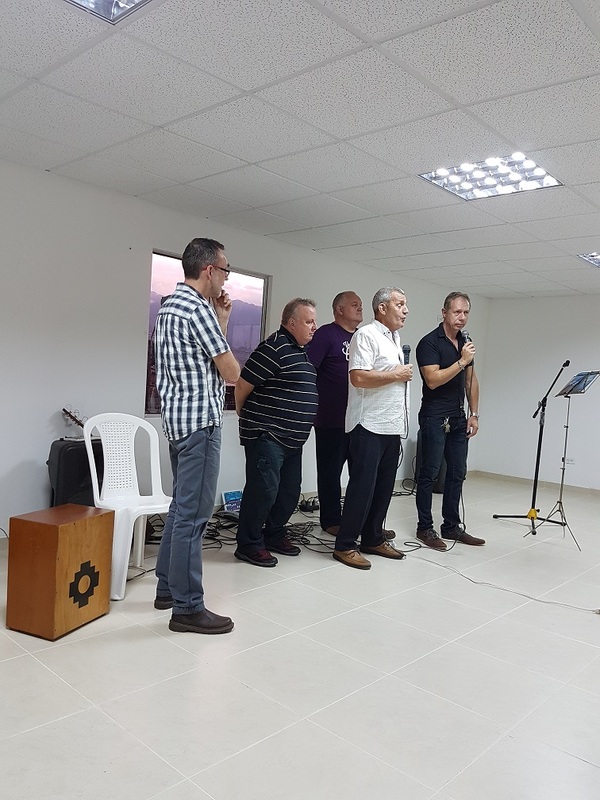 It was fantastic to be able to hand over such an amazing building to the lovely church, El Abrigo, and it’s Foundation, in Cali, last Sunday evening. It was also a thrill to be able to stream it live, on the internet, and an edited and enhanced version of the video will be available soon, which I’ll put here, on my YouTube channel (www.youtube.com Paul Bennison), and on Facebook and Instagram. If you weren’t able to see it or missed the abundance of messages I sent out to say it was going to be streamed (! ), the ‘speeches’ – Hendrik (Hein) Hoere, Thanney Pyper, Johnny Mawhinney, and me, were filmed on my phone, and the speeches paint a good picture of the whole project. God’s promises are ‘yes’ and ‘amen’…. and so much more sometimes! When, on a constant basis, you experience God’s promises happening, and doing so much more ‘behind the scenes’ in order to fulfil them, it’s an indescribable privilege to be at the sharp end of seeing God do incredible deeds. With a team of not-so-fit people – Thanney a hand short (broken left hand), Johnny a prolapsed disc and trapped sciatic nerve – the kid’s foundation building accelerated away to completion with three hands among the team who were building: Dennis not so long ago had a hip replacement, Cathy with an under-active thyroid, and yours truly – two days before we flew out, I couldn’t walk, and had to think twice about meeting up with Thanney at Starbucks half a mile away! Simon, who came for the last week, seemed to be the only one who was complete! Thanney’s said that he’d never have got that building completed in the UK and that with all the frustrations of trying to get materials and contracted workmen to arrive when expected in Colombia! – in the same time-frame as it was completed in El Vallado, Cali… actual building time well less than 8 weeks. And if you’ve seen it, you’ll see how amazing it looks…. God multiplied the work of three hands and a crocked back – and, in fact, improved Johnny’s back visibly significantly. He stretched money, time, patience, ‘negotiated’ deals with local companies that would never normally happen in Colombia…. like the air conditioning company suggesting that they’d reduce the cost of two units by 1,400,000 pesos (£400, $500, 450 euros) and instead of 16BTU units, supplying 24BTU units – much more appropriate in a building that size but Thanney had insulated the place so that 16BTU would have been ok…. it was a real blessing. Money stretched, though we ended up a bit short of our £55,000 budget, when the final bills came in, Thanney and Johnny worked like trojans, frequently – more than frequently! – up and down a narrow somewhat precarious steel staircase on the outside of the building, carrying tons of rubble, and bearing in mind Johnny’s back, that was a miracle. Countless miracles and healings in churches, quite a few documented in earlier blogs, posts on Facebook… covered everything from the ‘ordinary’ to terminal illness, wonderful responses from churches, new relationships and connections made – even after 21 years of going to Cali – listening again to the incredible miracle testimony of the pastor of the church, El Vive, Dario, who should have died three years ago, but is very much alive after being prayed for…. I could go through the programme for the trip all over again – fantastic churches, wonderful pastors, amazing people – if there’s a more friendly, all-embracing, nation of loving people, I haven’t found one. And to have the privilege of being blessed by people who live in such poverty is a blessing from God: and to try and bless them, well, it’s such a blessing. We took one pastor and his family out for a meal – this would be a couple in their late 30’s maybe early 40’s – to the steak restaurant (it’s cheap – to us – there) – and to have said to you, ‘Thank you, Paul, we’ve NEVER had a meal like this in our lives, never eaten steak before’ – a couple who can’t afford less than 40 pence for very ordinary but good yoghurt for their son…. God has wonderful ways of fulfilling your dreams, too, as Thanney has discovered with the foundation, and for Dennis, who ‘struggles’ normally with hot temperatures, going to Cali (normally 35C in the afternoons, and rarely less than 22C at 4 in the morning, was a step of faith – and God gave him the coolest two weeks I’ve ever experienced in the city! Now, I’m already working on teams and final dates for Cali teams for 2018: it’s the sort of place that’s like a magnet, and for me, the moment I leave, I can feel it pulling me back again! From 35C temperature to 6C – oh joy! Home we jolly well go! For me, a little bitter-sweet, as, once again, another piece of my heart is left here in Cali: if home is where your heart is, then I’m going back to Northern Ireland and leaving home behind! I must say, though, that I look forward to my recliner and football on TV! Cali truly has bitten big ‘chunks’ out of me over 21 years and almost 90 visits – I think I even saw my hat laying in an apartment near Wilmar, so that must be near my home! Lol! We’re ‘killing time’ now waiting to go to the airport for the long-haul home: in an hour, we’ll be collected, in 4 hours we’ll be on our way to (oh joy again!) a good few hours in Bogota airport. Thankfully, it’s a new airport – 10 years ago, 4-5 hours there was far more of a nightmare option than it is today! London Tuesday afternoon around 2.30 pm… then on to Belfast, and home around 9.30 pm UK time. Luggage loaded with Juan Valdez Coffee, Cafe Quindio, and Oma Coffee, so plenty of caffeine for weeks to come to remember this trip by. To all of my little team – a massive ‘thank you’ for all that you have done here, and all that you have meant to the folk here. You’re all a blessing to me, I’m only sorry that I slow you down when you’re rushing for the steaks at Lenos & Carbon, the old knees not quite as quick as they once were! Dennis and Cathy – you were a blessing way beyond anything you think you might have achieved here. Such a delight to have you BOTH with me…. ANY TIME. Thanney – what can I say? The vision, the dream, the goal fulfilled: you did it, mate! AND you got your miracles of healing too…. Johnny – in less than 3 months we’ve gone from ‘hello’ through a 3 hour brekkie at the Pit Stop to miracles – in your own body, the blessing of being part of the ‘new ‘ foundation, to miracles in the bodies of many other people. Oh, yes, and a really great friendship, too, now WAY beyond hello…. Simon – 6th time in 7 years, your preaching is such blessing, YOU are such a blessing, and your humour very nearly rivalled that of Dennis’s humour! And Jesus – you’ve been here all the way with us, blessing us with your power to bless others, blessing us with strength, doing what only you can do, and keeping us safe in the ‘wonderful’ Cali traffic… thank you, Jesus. Where on earth would I be without you? 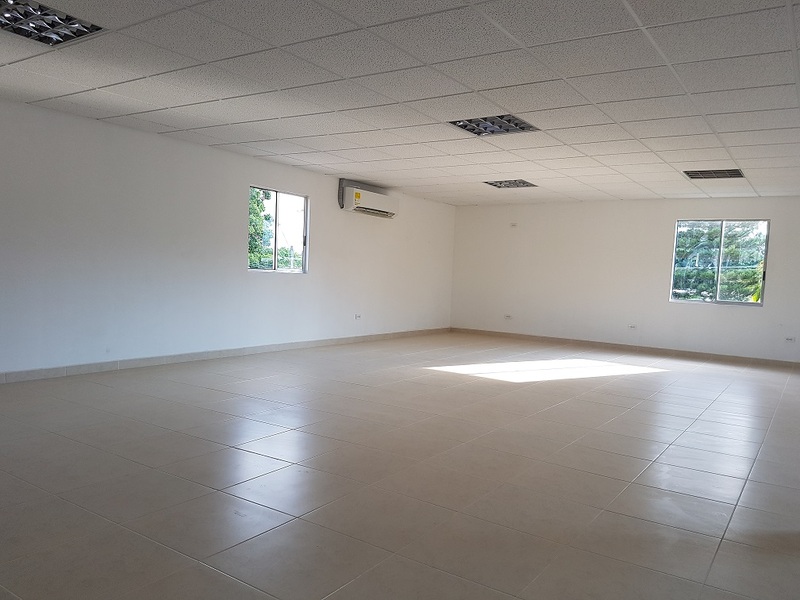 The delight of blessing others – fulfilment of a dream – the El Abrigo brand new kids centre! So… it’s done and dusted! 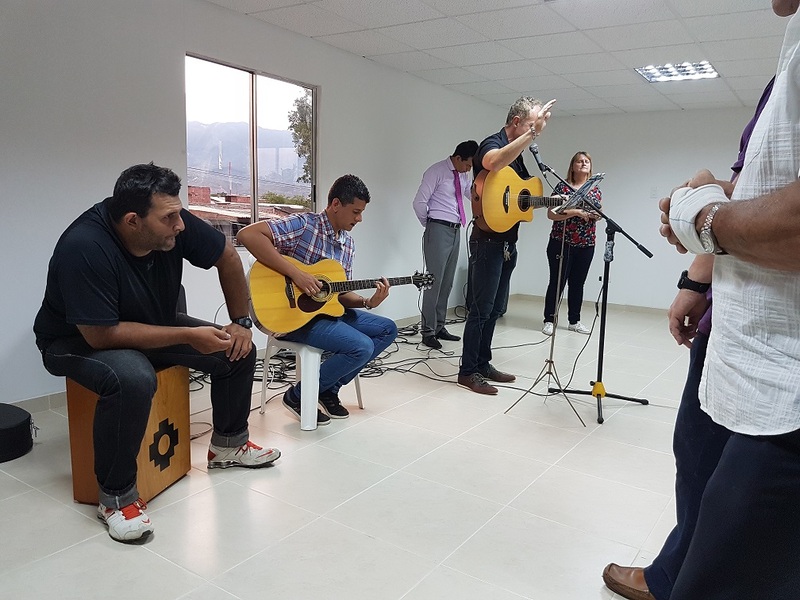 The construction is finished, it looks fantastic, and now it’s in the ownership and care of the lovely folk at Mision El Abrigo church, and their Foundation. We have no way of knowing, I don’t think, how many people watched online yesterday – it seems from comments and posts on Facebook and other social media, that there quite a lot – to Thanney, especially, it meant the world, a time when he could genuinely say that a God-given vision reached fulfilment, and will bring generations of blessing to countless kids, as well as those who begin to pass through it as a church. It was such a joy to share in the handing over, and comments that were made about Thanney, Johnny, and the others, who have worked tirelessly, were all well-deserved. Thanney was very naturally a happy and ‘proud’ – in the right sense of the word – man, last night: I was too, for him and Johnny, Orlando, and so many others who have worked tirelessly. I’m indescribably grateful to all who have responded to my mass of letters, messages, posts, appeals… and given incredibly to this poverty-stricken barrio in Cali a building worthy of the poor, that they could never have had were it not for you. With the expenses of last night, things like giving a gift to my dear friends who did the filming/streaming, and other incidentals, we handed over the building just about £1200 short of our budget. Not bad, out of £55,000: from my own point of view, it’d be a real blessing to see the Lord sort that last bit out, too! The event was recorded – it will be edited and include ‘still’ pictures from the various stages of the construction, from a bare flat concrete roof, through it’s various metamorphoses to the lovely, bright, air-conditioned facility it is today. Wilmar had a vision 8 years ago of the Foundation being like a lighthouse: the fact that the new construction is on the 4th floor (3rd in UK!! ), and it has good windows, and super-bright LED lighting, it is, indeed, like a lighthouse. We didn’t know of Wilmar’s vision until a few weeks ago, so it’s a real blessing to us. A church /kids foundation that is a light to the darkness of a tough barrio, El Vallado. When the filming is edited, it’ll go on YouTube, Facebook, Twitter, and anywhere I can find to put it! It’ll also be available as a DVD, too. 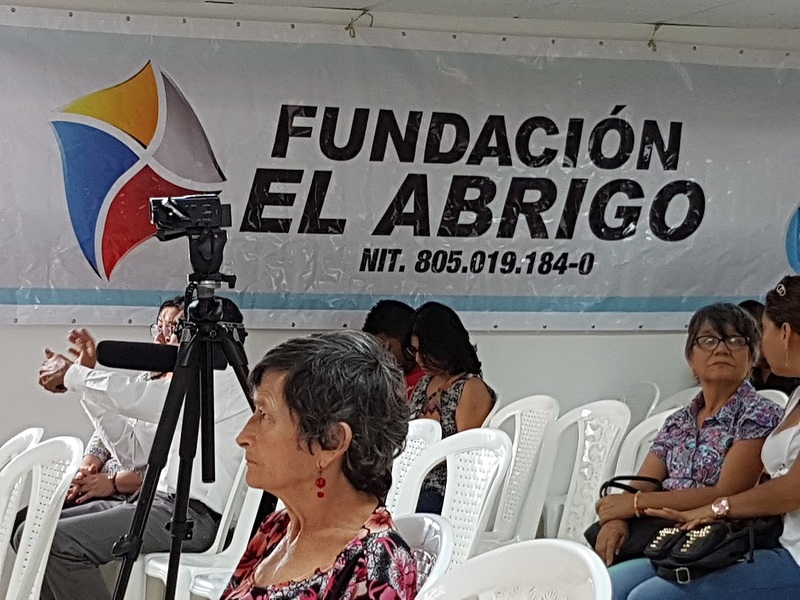 It’s looking good for the live steaming of the handover of the new building to the leaders of the El Abrigo Foundation, a little later than planned, but it will be recorded too. I’ll send the stream link as soon as I know it!